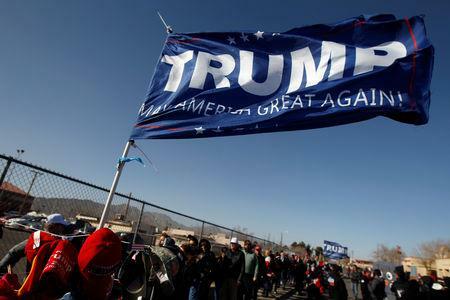 EL PASO, Texas (Reuters) - Potential White House hopeful Beto O’Rourke accused Donald Trump of fear-mongering on Monday and the Republican president mocked the Democrat as a "young man who lost" in dueling rallies that could preview the tenor of the 2020 election campaign. 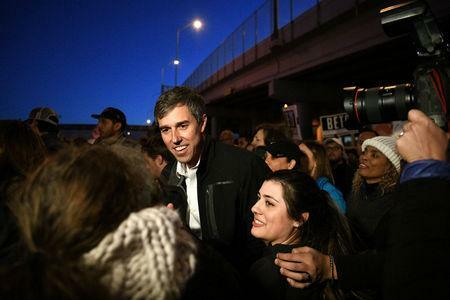 O'Rourke, who narrowly lost his 2018 bid for a U.S. Senate seat, accused Trump of stoking "false fear" about immigrants and telling "lies" about his hometown El Paso, which Trump said was a dangerous place before it had a border fence. "We stand for America and we stand against a wall," O'Rourke told a crowd of several thousand supporters, many waving "Beto 2020" signs and wearing "Immigrants Make America Great" baseball caps. "Walls do not save lives, they end lives." Two hundred yards away in El Paso County Coliseum, Trump told his supporters that O'Rourke had "little going for himself, although he's got a great first name." "We are all challenged by a young man who lost an election to (Republican Senator) Ted Cruz," said Trump. He said that O'Rourke's rally was smaller than his, and that was a bad sign: "That may be the end of his presidential bid." Reuters could not verify Trump's claim that 35,000 people attended his rally, with about 10,000 inside. The city's fire department allowed only the capacity 6,500 inside, the El Paso Times reported. 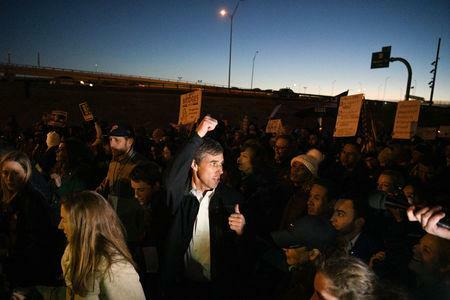 Police estimated between 10,000 and 15,000 attended the O'Rourke march and rally, the newspaper said. Trump made clear on Monday he would not drop the demand for a border wall that delights his followers, first made in his campaign in the 2016 election. Giant banners at his rally read "Finish The Wall." Trump said he had heard about a possible deal in Washington before he took the stage, but added: "Just so you know - we're building the wall anyway. Maybe progress has been made - maybe not." It was Trump's first direct clash with a potential 2020 rival, albeit on separate stages. "I will never sign a bill that forces the mass release of violent criminals into our country," he said, referring to a Democratic proposal in the Washington talks to lower the cap on detentions of criminal aliens by Immigration and Customs Enforcement (ICE). Although O’Rourke's full-throated denunciation of the president sounded like he planned to run against Trump, the two-time congressman declined to discuss a potential bid when asked by reporters on a conference call on Monday.